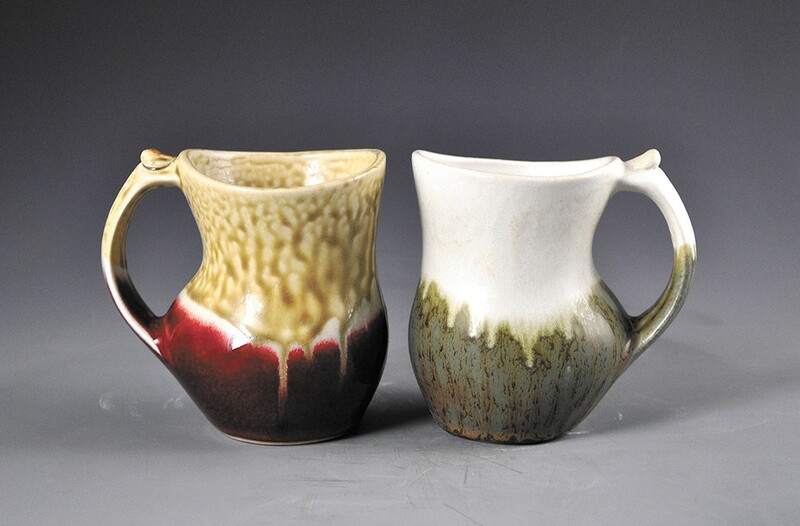 A pair of mugs by Loren Lukens featured in Trackside Studio's "Cup of Joy" show. Trackside Studio's "Cup of Joy" is a celebration of, as the name suggests, drinking vessels. The show features the artistic mugs, cups, steins and more from nearly three dozen potters from around the country, including artists like Seattle's Ken Turner. "I've been collecting cups for several years now, and I have fond memories of acquiring each one. As I select a cup to use, the history is relived in my mind and brings me joy," says Turner. "I do have favorites. A favored cup from which to drink; it slakes my thirst, it warms my hands and collects the steam, capturing the aroma before it releases it in short wafts beneath my nose. Still others sit on the shelf for their beauty alone, but bring me pleasure nonetheless." Whether it's coffee in the morning mug, an oversized cup of soup or a tankard of beer, a favorite vessel becomes part of the ritual, enhancing the experience in a way that plastic and Styrofoam cannot. There's a pleasant weight in one's hands. A familiar clinking sound after the toast is made. A visual reminder of time, place and even the individual hands that formed it. "A simple cup can be the beginning of a clay collection," says Gina Freuen, who teaches art at Gonzaga University. "A collection of cups can sometimes lead to something larger." Drawing upon her 40-plus-year career in ceramic arts, Freuen, who joined Trackside last year, organized the event alongside founding studio members and participating artists Chris Kelsey and Mark Moore. One of the intentions of the exhibit, explains Freuen, is to "include local work along with nationally recognized artists, and have an inclusive show rather than an exclusive" one. Participating local potters include Lisa Nappa, Jill Smith and Mat Rude, whose vessels looks like archaeological treasures, with a combination of flowing glaze and scarred surfaces typical of wood-fired pieces. Potters from across the country were eager to provide work as well. Martha Grover shipped work from her Helena, Montana, home prior to honeymooning in Rome, says Freuen. And Florida's Justin Lambert did the same before boarding a plane for his artist residency in China. "Potters are competing with every commercial outlet that sells pottery: Pottery Barn, Pier 1, etc.," says Freuen. "Those outlets have lines of pottery that appear homemade, but are priced below what a potter can charge if they include all their costs." Although some participants might see only modest profit — minus shipping costs and Trackside's commission — Freuen says the show is part of a larger national movement toward an appreciation of items as seemingly simple as an artful drinking vessel.